God says that you are a priest. Depending on your background, that may be scary or confusing. “You come to him as living stones, a spiritual house that is being built into a holy priesthood” (1 Peter 2:5 GW). Peter is saying that the two benefits that priests have are now available to everyone who is a believer. They had the right, privilege, and responsibility to go directly to God. They could pray and talk to God, worship, and fellowship with God. Everybody else had to go through a priest. The priest had the privilege and responsibility of representing God to the people and ministering to the needs of other people (serving). The Bible says that when Jesus died on the cross, there was a veil in the temple that separated the Holy of Holies, where God’s Spirit was, from where man was. Only priests could go behind that veil once a year. When Jesus died on the cross, God ripped that veil — about 70 feet — from top to bottom, symbolizing that there no longer was a barrier. 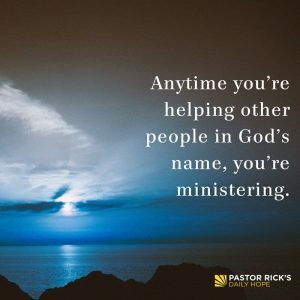 You have also been gifted for ministry to serve other people. Every Christian is a minister — not a pastor, but a minister. Anytime you use your talents and gifts to help others, you are ministering. “He saved us and chose us for his holy work not because we deserved it but because that was his plan long before the world began” (2 Timothy 1:9 TLB). Why did God save you? So you could serve him. A non-serving Christian is a contradiction. How do you know what your ministry is? Look at your talents, gifts, and abilities. When you use those talents and gifts to help other people, that’s called ministry — nothing fancy or scary about it. It’s just helping others. Can you be a priest in a sales office? You bet you can. Can you be a priest as an accountant? Of course. Driving a truck? Sure. Anytime you’re helping other people in God’s name, you’re ministering. How have you grown closer to Jesus through other believers’ ministry and service to you?